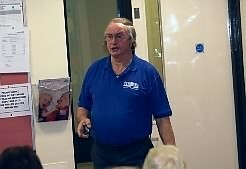 38 members and 3 visitors attended our May meeting when Peter Parker, a recovered stroke victim, came and gave us an interesting and informative talk. Peter told us about what happened to him in 1987, at 44 years of age, when he had a stroke which was not diagnosed for 12 days, even though he contacted his GP, went to A&E, and was sent to a General Ward at Broomfield. He recovered when he was sent home having only had a week of therapy, using his own initiative, adapting the exercises physiotherapy had given him, brain training to increase concentration, and jogging to give physical exercise. Patients suffer tiredness, and he still does, and often depression is another factor to be taken into consideration. He persevered and was able to windsurf across the Channel in 1989, windsurfing being one of his targets when he was so ill. Things have changed since then with a £12m campaign starting in 2009. If you have symptoms like those covered in F A S T – Face, Arm, Speech, Time – call 999 – strokes which are treated early give a much better chance of recovery. 1 in 6 people will have a stroke in their lifetime with a quarter of them in the under 65’s of which one third will live, one third will have some form of disability and one third will die. Peter has publicised and raised money for the Stroke Association ever since. Refreshments were available, as well as leaflets about Stroke Awareness, and there was the opportunity to ask questions and obtain more information from our speaker. PAWS next get-together is on 24th June when D. Clarke will speak about “A Garden Holiday Experience”. Currently membership is full but visitors are very welcome at the cost of £3.50 which includes refreshments. Details of all our meetings and speakers can be found on the diary of the home page of the Winstred 100 website. 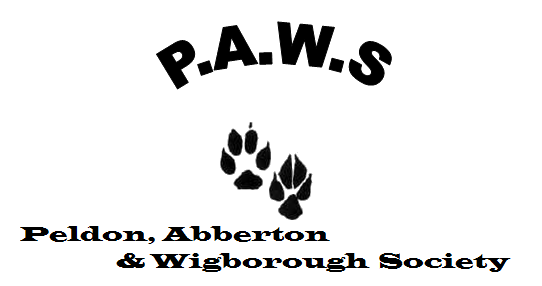 If you would like further information about PAWS please ring one of the following committee members: Alice Holmes 01206 735510, Jane Banks 01206 735004 or Jane Anderson 01206 735505. Present: Netty Knill-Jones, Lynne Simmons, Phil Gladwin, Nicky Ellis (chair), Jane Banks, Charles Dymond, Andy Beharrell, John Walker, I Police Officer, 2 Zone Wardens, 5 adult and 5 children members of the public. Police report: There have been few crimes in our villages but 1 burglary and a couple of traffic accidents. There is a new officer in Tiptree and can be reached on 07966 197404. Zone Wardens: They are reporting pot holes, carrying out litter picking, assisting with dog fouling problems and other services where ever they can on our behalf. A gift of a bench will be discussed with a councillor for positioning on Moss Hay. Public: A quad bike has been seen driving around on Moss Hay and Pete Tye Common, a dog fouling culprit was spotted with several dogs along St Ives Road, the bench on the bus stop triangle at the bottom of St Ives Road needs painting, a ditch full of litter along Maldon Road needs attention and road signs at the Kings Head junction in Great Wigborough are missing probably due to accidents, all of which will be dealt with hopefully in the near future. Thanks were given to Archie and Shaun for the litter picking they do in Peldon. The children: They came to make a request for a skateboard ramp on Moss Hay. They all spoke individually to make their case and presented us with a drawing of a ramp. This will be investigated for cost, area required and insurance. Other villages with these will be visited for an idea of what would be suitable, if any, for Peldon. Public: A resident from Salcott came to express their concerns, particularly with regard to the height, about a planning application for 2 semi-detached houses replacing a bungalow in The Street at Salcott. The owner of the property was also in attendance and gave his input into the discussion. Details will be looked into by our Borough Councillor and discussed with the Planning Officer. Phil proposed, John seconded and all agreed for Nicky to continue as Chairman for this next year. Jane wished to step down so Phil proposed, Nicky seconded and all agreed for Charles to be Vice-Chairman for this next year. Phil proposed, Nicky seconded and all agreed for Sue to continue being the Financial and Responsible Officer. Borough and County Councillors: County report will be circulated. Kevin had been in contact with ECC Highways with regard to rectifying the collapsed verge along St Ives Road. Chairman’s Report: A brief summary was read out and it was circulated to the parish councillors and will be on the website. Financial Report and the External Auditor’s End of Year Return and Annual Governance Statement: Nicky proposed, Phil seconded and all agreed to approve these. Our sincere thanks go to Steve Copeland for carrying out our internal audit for us without charge yet again. 1. Churchyards Upkeep Donations – Phil proposed, John seconded and all agreed, except one against and one abstention, to donate the usual amount of £200 each to help with maintaining the churchyards. Yet again we will express the possibility of reducing this next year if the need arises due to reduced funds. 2. Playgrounds and Playing Fields – following the Annual Inspection Report certain matters will be addressed and other matters will be discussed with the inspector due to some confusion over certain comments in the report. 3. Flooding at Salcott – yet again CBC Simon High will be contacted with the purpose of meeting a Salcott councillor on site to discuss ongoing problems. 4. Broadband update – Stage 2 is underway, a launch event is planned for late July and the target date for going live is September. 6. Wigborough Telephone Box – the person who requested to buy this box will be approached again followed by a second interested resident before we decide to accept this offer of cleaning and painting. 8. To confirm Parish Council representatives on the Wigboroughs Village Hall Management Committee – Nicky proposed, John seconded and all agreed for Phil and Jinny to be our representatives on this committee. 9. Abberton Rights of Way Committee – meeting was attended and a consultation event is to be planned to find out what the public would like with regard to this path surrounding the reservoir. 130681 Proposal: Demolition of existing bungalow and erection of 2 no. two and a half storey semi- detached dwellings (resubmission of 122083) at Old Barn Burrows, The Bungalow, The Street, Salcott. 38 members and 2 visitors attended our May meeting where we met Mr. W. Jones from the “Palace of Knightsbridge” – more commonly known as “Harrods”. He entertained us with stories covering his 40 years with them, having started work as a Trainee in September 1963 and retiring in 2003 as the Licensee. He was wearing a rather fetching frock coat which had been made for him, at a cost of £750, with a crest on the pocket bearing the store’s motto “All things to all people everywhere”. He gave us the history of the store from when Charles Henry Harrod took it over in 1849, when it was in financial difficulty and not in the best of areas, but seeing the potential as wealthy Victorians were building houses to be near to the Royal family. By 1883 his Son Charles Digby was running the business (Dad sold it to him for £600) and expanded it greatly employing some 150 staff. 7 days before Christmas it burnt down taking most of Knightsbridge with it. By 1889 it was rebuilt and claimed amongst its customers Oscar Wilde and Lilly Langtry who were given store credit cards. By now he had taken on a Managing Director – Richard Burbridge who had lots of new ideas re advertising and publicity and one of these was to kit out the solders for the Boar War – what a novel idea. Between 1910 and 1920 Harrods was rebuilt to be the biggest and best store. Because electricity and water supplies could be erratic, and so his customers would never be inconvenienced, he had wells drilled and a power house installed in the basement. In 1955 the Burbridge family lost control of Harrods to the Al Fayed family and as we all know it was sold again recently for 1.5Billion. Next month is our annual social night on 27th July. This years theme is South American, so join us for Salsa and fun with Mark Moore and Partner. We will also have refreshments and a light themed Supper. There will be a prize for the best dressed, so raid your wardrobes ladies and whilst there don’t forget your dancing shoes! As usual we meet at 7.30pm in Peldon Village Hall, Church Road, Peldon. Membership is currently closed. Visitors are welcome cost £5.00 by pre-booking on any of the following numbers. Alice 01206 735510, Jane 01206 735004, Julia 01206 735053 or Sue 01206 735212. Report from the Peldon Village Hall Management Committee on Tuesday 4th May addressing, amongst other things, the exciting prospects for new Village hall.